It’s been exactly one month since we launched Petbo on Kickstarter and we are proud to announce that we have reached our funding goal with one more day to go. As we are now moving forward to prepare the first round of production we are also releasing the first sneak peak of our next cat haven, the Petbo TV. 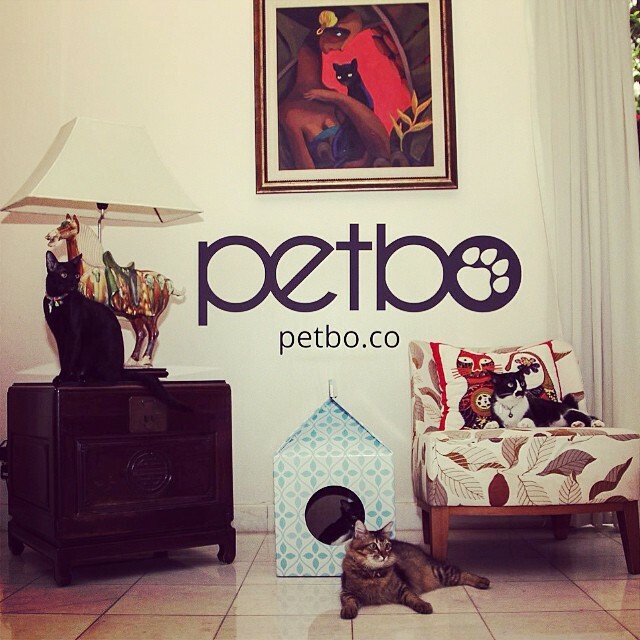 For more exciting updates and news follow us on Instagram , Facebook and on petbo.co. Research has shown that cats — predators by nature — need a place to hide, play, relax and observe their surroundings from without being spotted or disturbed. They need their own territory that they don’t have to share with others. They need their own little kingdom. This became very clear to us after moving to a smaller apartment with our 2 cats. The apartment was lacking dark and private corners so our adorable felines played and napped in pretty much anything they could squeeze themselves into. The dryer was Flake’s personal favorite, especially when we forgot to take the clothes out. Leon on the other hand preferred a closet. So to offer them their own private space they so much needed, we decided to get them a playhouse. But once we started to look around there didn’t seem to be many great and affordable options. Either we would have needed to sacrifice on the appearance or on the eco-friendliness and we wanted to do neither. We have a saying in Estonian (my native language): “self-made is well made” and with that in mind, my partners and I sketched our own first playhouse prototype. Our goal was to create a beautiful playhouse for cats that would look great, that’s environmentally friendly and yet at an affordable price. If you want to get a playhouse for your furry friend, now it’s your chance. 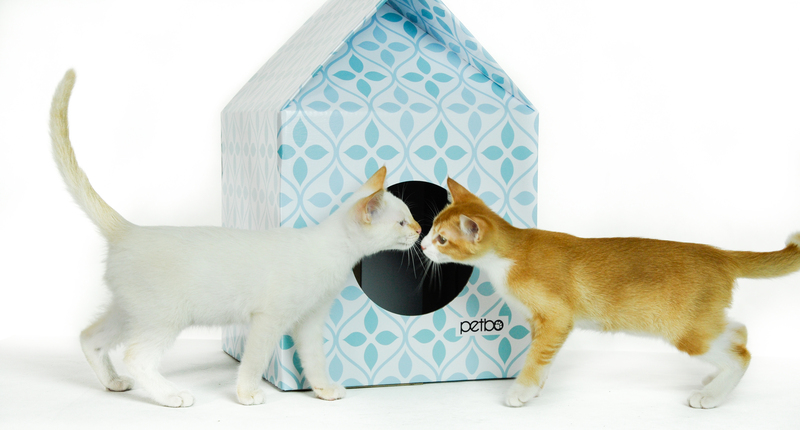 Petbo just launched environmentally friendly playhouses for cats on Kickstarter. The cat needs a box and a box needs a cat. It took us 6 months to develop a first proper prototype which would look like something we want to move forward with. 6 months of designing, engineering, re-thinking, optimizing and manufacturing. Long process, but boy it was worth it. Now we are almost done, ready to present special playhouses for pets. A gift every cat dreams of (a part from some tasty chicken and beef of course). 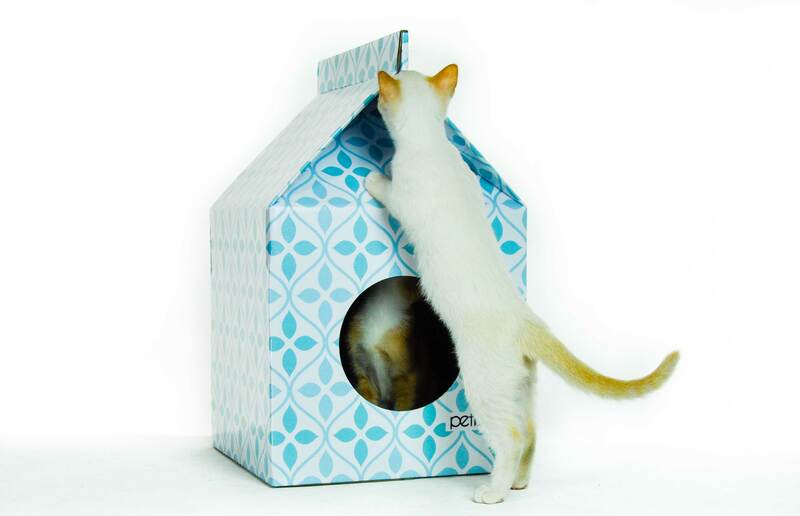 A playhouse for cats to fulfill their instinctive need to hide and have their own space. That comes with the nicest prints to accessorize every home while still serve as a playground for pets. It was 3 years ago when I picked up two stray kittens from the bushes of a park. Just as I was jogging past them I heard little tiny kitty voices. It was sort of like cliche- day turned to evening, slightly dark and a minor drizzling rain. Of course enormous felt of pity and amount of cuteness swept over me and there I was jogging back to my home with two kittens in my arms. Cats, predators by nature, need a place to hide from other living creatures, noises and smells. A place where they can observe their kingdom in peace and without being noticed. Even more they need if they are kept in a closed environment (such as a house or an apartment). Wild nature serves them well with tons of spots for solitude by offering places which makes them invisible for the rest of the world. But through evolution many cats have moved from endless wilderness to a 1,000 ft households, now they need to find their own spots in much smaller territory of their new homes. This is why you find them sleeping in the dryer, under the coach, in your closet or every bag or box you bring home. They need their territory, their own place, their own box. Finding a box for two felins was easy. Their first box was not sturdy enough to last for longer, so cats moved to an IKEA box which I borrowed from a friend for moving. Cats have their own agenda and decision making, they don’t really take your plans into account most of the time. So the borrowed IKEA boxed turned into cats new playground, I had no say. After moving to a beautiful apartment in the heart of the city, the cardboard Ikea box felt out of place. Or to be precise had no place within the interior design of the apartment. The hunt for a beautiful cardboard box had begun. What seemed simple was not. Unfortunately the playhouses we found were either of a very outdated design, not suitable for our home, or they were nicely designed but far too expensive. This led us to create something on our own. 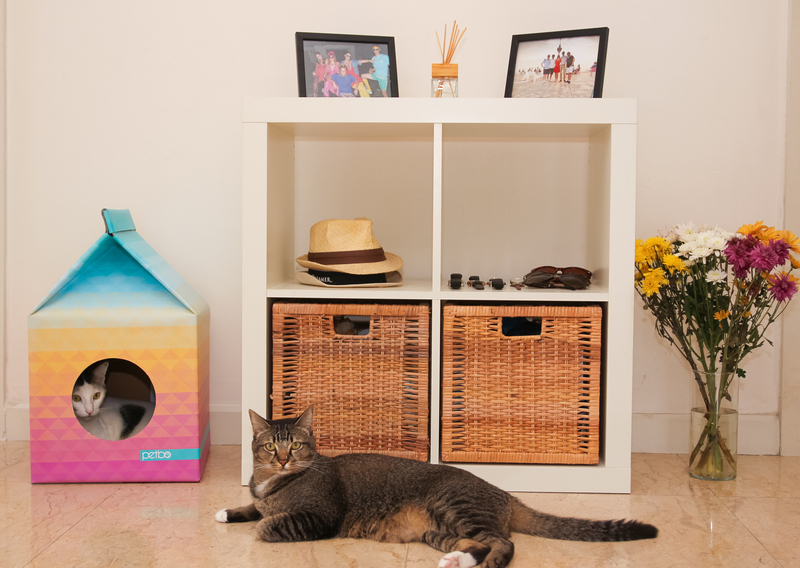 A playhouse for cats which would offer them security, solitude, a hiding place while being environmentally friendly. A playhouse which would look great and accessorise any household and also serve as a playground for pets. We created Petbo. But more on that in the next post.